“The Impact Hub Global Network is an impressive force for collaboration and innovation,” Governor Herbert said. 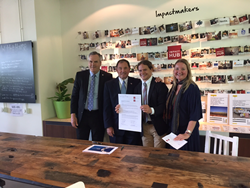 Utah Governor Gary R. Herbert, accompanied by his Western European trade mission delegation, visited Impact Hub Amsterdam to explore opportunities for increased collaboration between Salt Lake City and Amsterdam. Tatiana Glad from Impact Hub Amsterdam and Dustin Haggett from Impact Hub Salt Lake signed a memorandum of understanding during the visit to formalize their partnership. The event was sponsored by Utah’s Zions Bank, and attendees included Udo Kock, deputy mayor of Amsterdam. Impact Hub first opened in 2008 and serves as a co-working space to provide social entrepreneurs with the resources they need to start their businesses. These resources include tax, legal and investor services. There are more than 60 Impact Hub facilities worldwide with over 11,000 members. The Salt Lake City location began as a pop-up and opened its permanent headquarters downtown in April. In the short time Impact Hub has had a Utah presence, it has contributed to numerous success stories including GREENbike SLC, Utah’s one and only bikeshare program, and the Whole9 eating program. Nutrition, clean air, social justice and alternate transportation are a few areas of social innovation thriving at Impact Hub Salt Lake. The Hub offers a place for startup businesses to thrive as well. Bags to Riches, Globism, Degreed, AnneB Design, Igniter i.o., Simple Citizen and Chapul have found great success after becoming members of the organization. Impact Hub Salt Lake recently announced their participation in a visa program in which individuals can apply for a fellowship and if selected, spend a year in Impact Hub Amsterdam networking, pitching and cultivating their ideas and expanding business in Europe. The fellowship announcement’s timing is significant as Delta Air Lines began offering direct flights between Salt Lake City and Amsterdam in May 2015. Editor’s Note: This event is part of the 2015 Utah Trade Mission to Western Europe. The mission, which runs from June 6-16, includes delegates from more than 20 Utah businesses, universities and organizations and spans five countries: the Netherlands, Belgium, Luxembourg, Germany and France. The purpose of the trade mission is to strengthen existing international relationships, open new markets and foster future business growth and investment in Utah. The Governor’s Office of Economic Development (GOED) charter is based on Governor Gary Herbert’s commitment to economic development statewide. Utah’s economic development vision is that Utah will lead the nation as the best performing economy and be recognized as a premier global business destination. IDTO assists companies in developing markets for their products and services in other countries. ITDO helps Utah companies understand the benefits of expanding into international markets and provides assistance securing international business connections. Through increasing international trade and branding Utah globally, ITDO helps grow Utah's economy, create jobs and increase Utah's international presence.